Doctor’s Day falls on the anniversary of the first use of surgical anesthesia. Dr. Crawford W. Long used ether as anesthesia on March 30, 1842 in order to painlessly remove a cyst from his patient’s neck. Now many hospitals host award ceremonies or hold special services on this day for respected physicians that have passed away. A red carnation is the symbol of Doctor’s Day. Flowers are always a nice gesture to either accompany a gift or stand alone. If you are going to give flowers, make sure they are presented in a vase. A vase allows the gift to be displayed in an office space or in a home. Typically flowers are given with a card. A simple card that says thank you can really brighten someone’s day! A thank you note should be included in the gift no matter what you get. When you’re writing a thank you note be sure to use stationary or a nice card. Next, decide whether you want to type your letter or hand write it. Handwriting adds a more personal touch but typed notes have a more professional feel. To begin your note, make sure you choose a proper salutation. Always refer to the doctor by their doctor title. An example of this would be “Dear Dr. Hansen”. Referring to them by their professional title is always appropriate whereas some doctors may not want to be referred to by their first name. Relationships between doctors and their patients should always remain professional. In the body of the note explain what you are thankful for and acknowledge that the doctor’s efforts were appreciated. The body of the note can say anything you want but don’t forget to show gratitude. For the end of the note, choose a closing that best suits your style. Sincerely and cordially are always professional and formal. For a more casual feel, simply say thank you and sign your name. Lastly, let’s discuss the gift. Keep in mind, in order to avoid ethical dilemmas make sure the gift is modest in value and professional. Personalized gifts are always appreciated. Things like frames, plaques, and pens can be easily personalized and still remain professional. 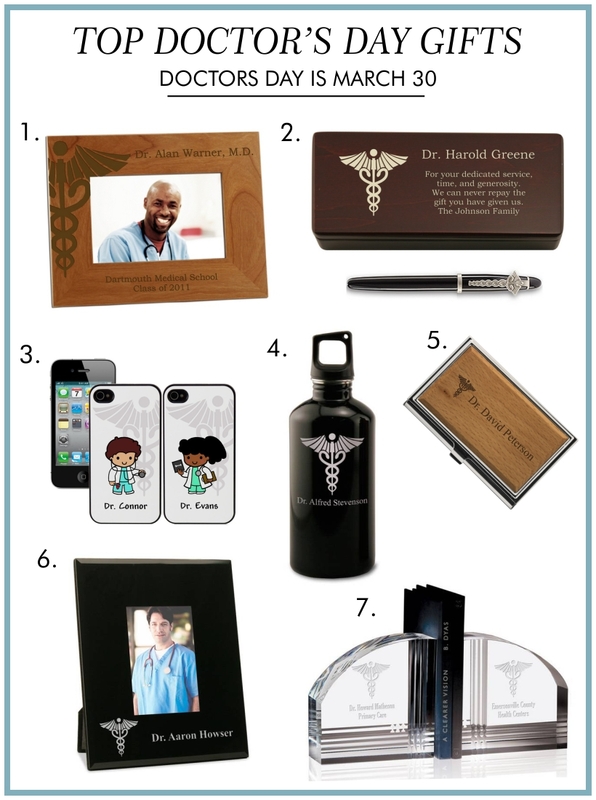 Below we’ve included some of our top Doctor’s Day gifts on memorablegifts.com. Find more gift ideas for doctor’s here!